Before we talk about burnt toast, let me share with you about what I was once told while enjoying my Sate Kajang (Kajang satay) - the satay that's famously originated from Kajang, Selangor. The delicacy is served with sliced or cubed cucumber for a purpose. The cucumber apparently 'neutralise' the compound formed in burnt meat that is believed to cause certain kind of cancer. No scientific evidence was offered to support the idea, but they advise us to finish the cucumber cubes anyway. Now, let's see what is ScienceFocus' take on burnt toast. Are you a fan of toast? Maybe it's a good idea not to burn it. It’s long been known that just over-heating, let alone burning, some foods can lead to the formation of compounds linked to cancer. These include heterocyclic amines and so-called polycyclic aromatic hydrocarbons (PAHs), which can lead to fried or smoked foods posing a health risk. 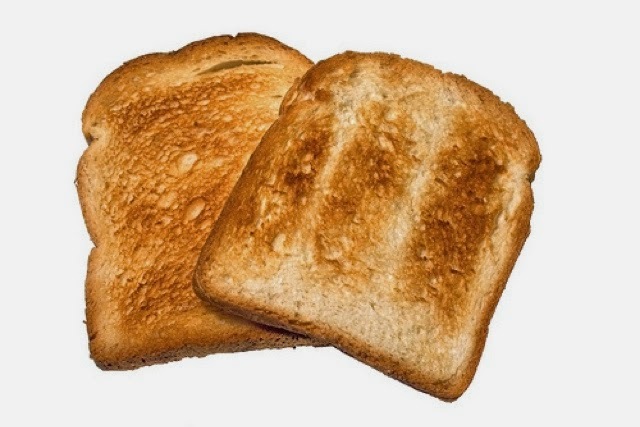 In the case of burnt toast, most concern surrounds the risk from the formation of acrylamide, a compound that has been linked to cancer and nerve damage in animals. That said, the evidence of a direct link between cancer and acrylamide in food consumed by humans is far from compelling. While some studies have pointed to a doubling in risk of ovarian and uterine cancer among women consuming this compound in food, other studies have found nothing. Even so, in 2007, the European Union’s health advisors decided to take a precautionary approach, and recommended that people avoid eating burnt toast or golden-brown chips as they may contain unacceptably high levels of acrylamide. TheGreenMechanics: So, while studies aren't conclusive, there's still belief that overly toasted bread can cause cancer. Have I been missing something? Because I have not been paying much attention to such 'risk' all this while. Food seems to be the cause of cancer but without proper research we will continue to enjoy it,regardless.